After 'camp day' here at minor league camp (meaning intersquad) we retired to the hotel around 4ish and were able to get some extra hours of rest and relaxation. I was able to catch the last 5 holes of the Arnold Palmer Invitational golf tournament after the UNC vs. OU game in march madness finished. 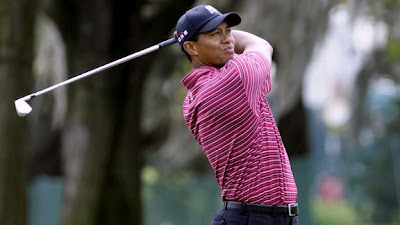 Tiger Woods was in contention for his first win in 8 months since he had a left knee surgery. As usual he was wearing his Sunday red Nike shirt (which means it's time to step it up for him) and entered the day down 5 strokes to Sean O'hair, but leave it to him to catch up. On the last hole he made a remarkable approach shot tied at 14 under, and with the other players watching, he needed to drain his very long putt for the win. In typical Tiger fashion he made a dramatic shot, sinking the putt and putting himself back in golfs' spotlight with his 66th career PGA win in just over 220 tournaments, that's a 29% win rate. You can see it in his eyes, I can almost imagine what he's thinking and how focused he has to be to succeed at that level. I am going to try and take what I can visually learn from him on a CBS sportscast, and interpret that into a pitching outing as well as I can. Tiger gets 1,080,000 for the win instead of the second place 648,000, but you can tell it's not about making that extra 432,000 for him, it's the hunger to win, and the focus that is all lifted once he sank that last huge putt. This is about the 10th time I've gotten to see him win a PGA event, it's always special and amazing to watch. I tip my cap, cheers, prost and give my kudos to the biggest 'gamer' I've ever watched.